← Are There Early Signs of Kidney Cancer? Some people with cancer may want to know the survival rates for their type of cancer. Others may not find the numbers helpful, or may even not want to know them. If you decide that you don’t want to know them, stop reading here and skip to the next section. The 5-year survival rate refers to the percentage of patients who live at least 5 years after their cancer is found. Keep in mind that many of these patients live much longer than 5 years after their cancer is found and treated. And survival rates are based on patients whose cancer was found and treated more than 5 years ago. Better treatments now may mean that patients have a better outlook. The numbers below come from the National Cancer Data Base and are based on patients whose cancer was found in the years 2001 and 2002. 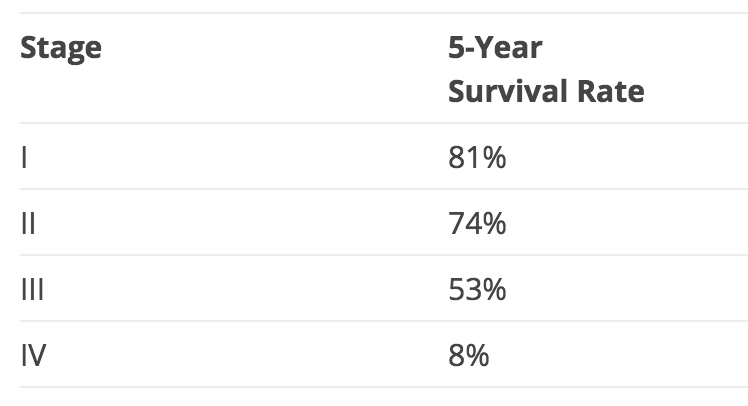 These are observed survival rates. They include people with kidney cancer who may have later died from other causes, such as heart disease. People with kidney cancer tend to be older and may have other serious health conditions. Therefore, the percentage of people surviving the cancer itself is likely to be higher. While these numbers give an overall picture, every person is different. Statistics can’t predict what will happen in your case. Talk with your cancer care team if you have questions about your own chances of a cure, or how long you might survive your cancer. They know your situation best. via Survival rates for kidney cancer by TNM stage. | Cancer Fact Sheet. This entry was posted in Kidney Cancer, Other Medical and tagged Cancer, kidney cancer, survival rates. Bookmark the permalink.